Like in real life, Facebook consists of people that respond to positivity. Being a grumpy cynic isn’t going to get more people to notice you. Positivity, on the other hand, goes a long way to help you fetch more followers. Having this reflected on your profile by posting cheerful, interesting things and portraying general happiness while commenting on others’ posts is the first step to gathering a fan base. News travels fast. Someone is more likely to like or comment on your post if you are prompt in your reaction to the latest news. If you can keep this up over time, your friends will automatically look to your profile to see what has been going on and what your take is on it. Remember to add your opinion to everything you post while not offending anyone in the process! How to become Facebook famous, you say? Spamming is certainly not the way. Often, in an attempt to come out as creative and opinionated, people start tagging their friends in everything they post in the hopes of garnering a response. Now, this is an absolute no-no! Facebookers do not take well to being tagged and/or spammed meaninglessly and this would lead to you becoming infamous! You don’t want to come out as too needy for attention. That is a complete turn-off for people. No one likes a post that just goes on and on. It gets labelled as TLDR (Too Long Didn’t Read) and most people just end up skipping it no matter how good the content is. The key to arousing a reaction from your followers is by being catchy, to-the-point and having a punchline. A good Facebook post is like a good joke. It must be short, understandable and must hit hard in the end! Are your selfies being ignored more and more? Do you think that the things you post aren’t getting the response they deserve? Maybe you are posting it at the wrong time. Know when your fan base is most active (this varies for each person), and make sure you post your photo at the peak time of your social circle’s activity. It is a sure shot to double the likes you receive. This might seem like the most obvious thing, but a good sense of humour is always very attractive. Make good jokes about present events happening in your social circle or the world in general. Good humour equals smartness, and that further equals to more people around you. People probably aren’t following you because you simply don’t pop up on their feed. Don’t hesitate to comment on others’ posts if you think you have good input to give. Beware though! Spamming isn’t a solution. So don’t just go around liking and commenting on every post in your feed. Not cool. Interact with people on your list, get to know them and let them know you. This is pretty obvious. The more friends you have, the more exposure your posts get. Try and add as many people as you can in your workplace, school or university. Don’t worry, no one knows more than 500 people personally. So don’t get disheartened by the popular people with more than 1500 friends on their list. These guys know how to become Facebook famous. Knowing them is always a good thing. This is a sure-fire way to increase your fan base. Create a page on topics that interest you and then you can share its posts on your wall and vice versa. This also lets you expand your circles just beyond people you know. In short, once you have a page, you have friends and strangers (read: potential friends) who know you exist. Signing up to GoodReads? Connect your Facebook account. Registering to some other cool place on the internet? Sign in through Facebook. Have an Instagram profile? Link it to Facebook. This lets your friends know that you have a life outside of Facebook on the internet and makes you look so much cooler! It showcases all your different interests and displays you as interesting and hip. Whenever you visit a cool place, use Facebook’s check-in feature to let your followers know where you are. Every time you discover a new place to eat, chill or party, let your friends know. Again, this lets your friends know more about your life outside the internet and makes you seem cooler when you post those party selfies! Facebook has that feature for a reason. And that reason is to sort posts relating to trending topics on the internet. So the next time everyone is talking about something, hashtag your opinions on it. Facebook’s sorting feature would make sure that your post is visible more than if you hadn’t attached that tag. It is also a cool way of expressing yourself; coming up with inventive hashtags is looked upon as cool which is exactly what you want to appear to your feed. Admittedly, this point should have come up earlier. One key way to maintain Facebook activity is to not let your status get more than 4 days out of date. It’s probably not cool to keep updating every hour (that makes you seem needy and that you have no life!). But to regularly post about different things, while adding views, photos and links is a great way to keep your profile on people’s watch list. Facebook isn’t the place to act all shy and introverted. No one is going to notice your presence if you are too embarrassed to post, comment or like. The best part about Facebook is that you don’t have to reply instantly. So take your time, think about the perfect response and then go ahead and speak up! 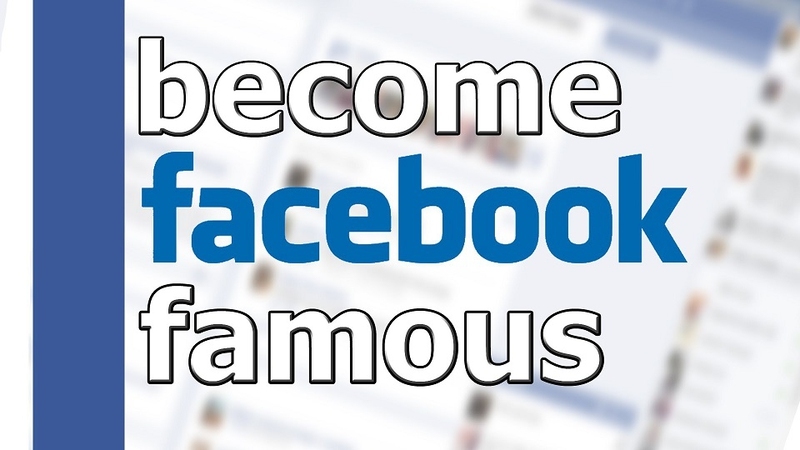 This might seem very trivial but it is one of the secrets on how to become Facebook famous. No matter what people say, everyone checks and reads every post on their timelines on their birthdays. Let’s face it. It feels good to get noticed. So when they see your name among the list of names, they will see that you actually care about them and boom! You’re more popular with them.